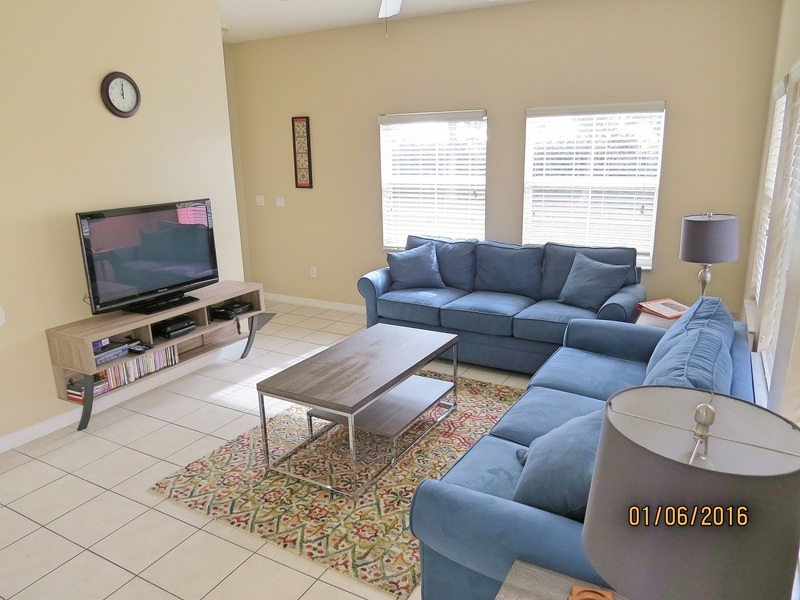 Luxurious, close to Disney, great location! Encantada Resort is a family-friendly gated community just off HWY192, just a few minutes from Disney's doorstep in Kissimmee, Florida and is perfectly placed for the shops, restaurants, fun and attractions that Orlando has to offer. With 4 bedrooms and 3 bathrooms, this fully air-conditioned, family friendly vacation home is perfect for families or for a few friends golfing or vacationing. 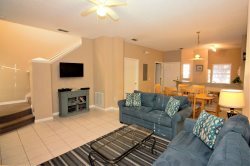 This Vacation Home has a spacious family room to relax in during the day or evening, with a luxurious queen size sleeper sofa, flat screen HDTV with Directv satellite, DVD and WiFi. The main living and dining area are completely tiled. Step from the family room into the spacious Dining room and visit with family while enjoying a great meal prepared in your own fully equipped kitchen. The huge table with six solid wood chairs is a great place to eat and relax with friends and family. The kitchen has been equipped with everything that you could need to provide a family feast to enjoy together. Off the dining room, is a screened lanai with lots of seating and lounge chairs and your own private pool! Luxurious sleeping accommodation awaits you when you stay at Encantada Vacation home with 4 bright and roomy bedrooms, 3 with TV's. The master bedroom has a king sized bed and a tv. It opens onto an attached ensuite bath with a big shower. The main floor bedroom has a queen bed with a flat screen HDTV and an attached bath. The other two upstairs bedrooms have two twin beds each and they share the hall bath. There is even a queen sleeper sofa, for when your group needs a few extra spots to lay their heads! Make use of the huge, zero entry community pool and 2 spas, in addition to your own private pool. Let the kids frolic the awesome playground. The 9000 sq. ft. clubhouse has a well equipped fitness room, just in case you can squeeze some exercise into your vacation time! Take a walk on the paved pathways to enjoy the grounds, beautifully lush with trees and gardens, as well as a lovely lake and gazebo area. Encantada Resort Vacation Home is truly an executive property with over 1500 square feet of luxury and a delight that you will want to enjoy again and again. Pool Heat (recommended for November through March) is $25/night or $150/week. 4 TV's, DVD players, free secured Wireless Internet, pack and play crib, booster seat for dining and a stroller. Resort Facilities: 2 Communal Pools & 2 Hot Tubs, Kids Playground, exercise room, Games Room, Internet Café. Linens and Towels will be provided and all utilities are included in the rental price. Our local management company will be available to offer any assistance you may need whilst in residence . Pool Heat (recommended for November through March) is an additional $25/night or $150/week.